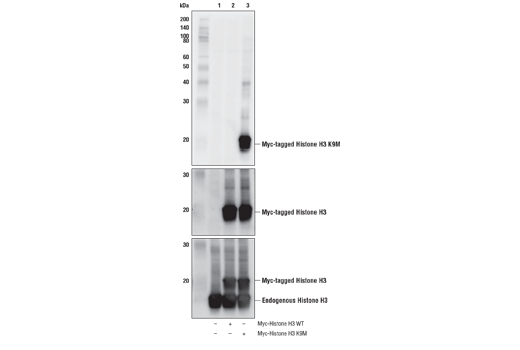 Western blot analysis of extracts from 293T cells, either mock transfected (-) or transfected (+) with Myc-tagged wild-type histone H3 (Myc-Histone H3 WT) or Myc-tagged K9M mutant histone H3 (Myc-Histone H3 K9M), using Histone H3 (K9M Mutant Specific) Antibody (upper), Myc-Tag (71D10) Rabbit mAb #2278 (middle), and Histone H3 (D1H2) XP® Rabbit mAb #4499 (lower). As expected, the Histone H3 (K9M Mutant Specific) Antibody only detects the Myc-tagged K9M mutant histone H3 protein and not the Myc-tagged wild-type histone H3 or endogenous wild-type histone H3 proteins. This antibody does detect endogenous levels of K9M mutant histone H3 protein. Histone H3 (K9M Mutant Specific) Antibody recognizes endogenous levels of K9M mutant histone H3.1, H3.2, and H3.3 proteins. The antibody does not cross-react with wild-type histone H3.1, 3.2, or 3.3. Polyclonal antibodies are produced by immunizing animals with a synthetic peptide corresponding to K9M mutant sequence of human histone H3.3 protein. Antibodies are purified by protein A and peptide affinity chromatography. Multiple exome sequencing analyses have uncovered a high frequency of histone H3 driver mutations in a number of different cancers, including diffuse intrinsic pontine glioma (DIPG), chondroblastoma, sarcomas, and HPV-negative head and neck squamous cell carcinoma. Previous studies have shown that lysine to methionine histone mutations in these cancers act as potent inhibitors of their respective lysine methyltransferases, resulting in gross alterations to the histone methylation landscape and deregulation of gene expression. In DIPG for example, the histone H3 K27M mutation is accompanied by a dramatic reduction in the levels of polycomb repressive complex 2 (PRC2)-mediated trimethylation of histone H3 lysine 27, changes in the distribution of PRC2 on the genome, and altered expression of genes associated with various cancer pathways (1-3). In chondrocytomas, the histone H3 K36M mutation functions to inhibit the WHSC1 (MMSET) and SETD2 histone methyltransferases, resulting in a reduction in the levels of histone H3 lysine 36 tri-methylation and deregulation of a number of cancer-associated genes (4). Similar to the H3K27M and H3K26M mutations, the histone H3 K9M mutation has been shown to inhibit the H3K9-directed histone methyltransferase G9a, resulting in reduced levels of histone H3 lysine 9 trimethylation. Given the widespread role of G9a in the regulation of gene expression, it is likely that this K9M mutation also plays a role in cancer. Chan, K.M. et al. (2013) Genes Dev 27, 985-90. Lewis, P.W. et al. (2013) Science 340, 857-61. Piunti, A. et al. (2017) Nat Med 23, 493-500. Fang, D. et al. (2016) Science 352, 1344-8. Jayaram, H. et al. (2016) Proc Natl Acad Sci U S A 113, 6182-7.